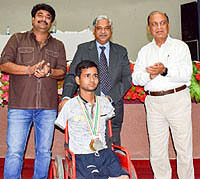 KURUKSHETRA : National Institute of Technology (NIT), Kurukshetra concluded its 2-day event “National IT Challenge for Youth with Disabilities 2018” which was in collaboration with Department of Empowerment of persons with Disabilities, Ministry of Social Justice & Empowerment, Government of India. According to a press note issued by the NIT the event was the outcome of international initiative carried out by Korean Society for Rehabilitation of Persons with Disabilities (KSRPD), Government of Korea in collaboration with UNESCAP. The press note did not specify the dates of the event but it was tentatively held in the last week of June. The objective of the event was to select a group of physically and intellectually challenged students to represent India at the International level. The chief guest Sh. K.V.S. Rao Director (R) Department of Empowerment of Persons With Disabilities, Ministry of Social Justice Empowerment, Govt. Of India, Officiating Director of NIT Kurukshetra, Prof. V. K. Arora and Convenor of the program Prof. Ashutosh Kumar Singh appreciated the participants for their sprit, efforts and their way of seeing the life even with the difficulties they have to face on regular basis. The participants were divided into four categories in singles and team competitions. In the individual e-tool event Rishabh Saini, Vaibhav Singh, Sourav Kumar Sinha and Manjot Singh got first position and Mayank Kotecha K. Gideon Jeevaratanam, Rishabh Singh and Mohini Sharma got second place. Mayank Kotecha, Abhijeet Nagpure, Mamta Bera and Manjot Singh got the first position and Rishabh Saini, K. Gideon Jeevaratanam, Sourav Kumar Sinha and Sunita got second place in the individual e-lifemap event. Rishabh Saini, Manjot Singh, K. Gideon Jeevaratanam and Sourav Kumar Sinha got the first position and Mayank Kotecha, Lovish Kumar, Abhijeet Nagpure and Sushmita Mondal got second place in the group event e-creative. Keshav, Prateek, Ujvala Kiran Dadi and Mamta Bera got the first position and Rishabh Saini, Manjot Singh, K. Gideon Jeevaratanam and Sourav Kumar Sinha got second place in the group event e-design. In the overall result, Rishabh Saini, K. Gideon Jeevaratanam, Sourav Kumar Sinha and Manjot Singh got first place which will represent India Internationally. This year India is hosting the Global IT Challenge. Mayank Kotecha, Abhijeet Nagpure, Mamta Bera and Lovish Kumar got second position overall the events. 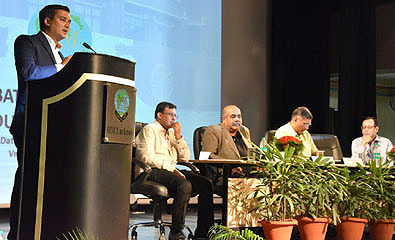 The event was graced by Prof Sathans, Chairman; Prof. Ashutosh Kumar Singh, convener of the programme and Dr Satish Kumar, Director N.I.T Kurukshetra. Other people including Dr. Ashwani, Dr. Sarika, Dr. Naveen and Ms Pallavi were also present at the programme. 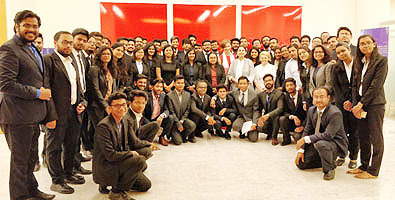 SIRMAUR (Himachal Pradesh) : Nascent Indian Institute of Management here held an impressive programme -- International Immersion Program -- at SDA Bocconi School of Management Milan, Italy between June 11 and 29. SDA Bocconi School of Management is the graduate business school of Bocconi University and is globally considered a leading B-school. A press note mailed to Academics-India by Saumya Rai said that "it was one-of-a-kind programme offered by IIM Sirmaur in collaboration with SDA Bocconi aimed at providing 360-degree immersive learning experiences by means of in-class sessions, case analysis, simulations, company visits and various activities that provided insight into Italian and European culture." The program gave IIM Sirmaur students an exposure to the dynamics of European economy and operations of leading European automobile manufacturers. Select SDA Bocconi Faculty who addressed the sessions included Prof. Olga Annushkina's, Prof. Andrea Dossi, Prof. Framcesco Gallman, Prof. Vitiliano Fiorillo and Prof. Silvia Zamboni. The closing ceremony was presided over by Prof. Neelu Rohmetra, Director, IIM Sirmaur, Prof. Giovanni Tomasi, Director of Corporate Custom Program and Prof. Olga Annushkina, SDA Bocconi School of Management in which the students were awarded course completion certificates. Prof. Neelu Rohmetra, Director, IIM Sirmaur, while thanking SDA Bocconi organising team hoped that the programme served its desired objective whereby the students were trained and engaged by world class faculty of SDA Bocconi and its allied corporate alliances. She highlighted the importance of IIM Sirmaur’s association with Bocconi School of Management and established how both the institutes are looking forward to a long, symbiotic partnership. SDA Bocconi School of Management is one of the top European Schools in the world rankings and is positioned at 7th rank globally in custom program ranking. The first week of the Program began with Prof. Olga Annushkina's delivery of macroeconomic aspects and effect of demographics on the Italian economy. This discussion was followed by a walking tour to Duomo di Milano cathedral, the Milan stock exchange and the Castle Sforzesco di Milano. An indepth session on global, multinational and transnational strategies, study of the Ferrari and a visit to ‘Museo di Ferrari’ concluded the course on International Business in the first week of the Immersion program. The second week of the program started with a visit to the 'Ricci Curbastro Winery’ in Franciacorta where students took note of Gualberto Ricci Curbastro's understanding of the market. The students were asked to develop an international market strategy for Ricci Curbastro. This visit was followed by an engaging session on International Finance by Prof. Andrea Dossi, who laid down the framework to study challenges of managing a multinational corporation. The course on Operations Management started with a proactive class by Prof. Framcesco Gallman. The sessions in this course covered the study of efficiency and utility. The discussion on Lean management started with a study of principles and performance measurement tools necessary for lean management. The torch simulation exercise that was included in the class was a great practical experience for both the groups that participated. The visit to ‘Maserati’ translated the learnings from Prof. Gallman's classes into the real world. The final week of the Program was about Supply chain management and Project management, taught by Prof. Vitiliano Fiorillo and Prof. Sylvia Zomboni respectively. LUCKNOW : The Indian Institute of Management here inaugurated its 34th batch of MBA and 15th batch of MBA-ABM students on June 24, 2018. The IIM admitted 447 students in this batch, 70 per cent of whom are boys and 30 per cent girls. Bringing in more diversity to the batch this time the commerce and economics students constituted 18 per cent of the batch, whereas Engineers are 70 per cent. The batch has students from 23 states and Union Territories. The Chief Economic Advisor, Dr. Arvind Subramanian delivered the inaugural address and advised the students to prepare themselves well in these two years with skill sets and knowledge for a changing global economic landscape. Dr. Shravan Subramanyam, M.D Roche Diagnostics India and Neighbouring Markets who was the Guest of Honour stressed in his speech that “Change” and “Choice” would be two key words that will determine the students’ career path. Dr. Ajit Prasad Director in his speech advised the students to work hard but stressed that happiness is the key to achieve a more fulfilling life.